King Leos of Károví, the tyrannical despot whose magic made him near immortal and who controlled a tattered empire for centuries through fear and intimidation, is finally dead. Ilse Zhalina watched as the magical jewels that gave him such power reunited into a single essence, a manifestly God-like creature who then disappeared into the cosmic void. Ilse is now free to fulfill her promise to Valara Baussay, the rogue Queen of Morennioù, who wants to return to her kingdom and claim her throne. Ilse will do all in her power to help Valara if only as a means to get to her home. Home to her lover, Raul Kosenmark, who is gathering forces in their homeland of Veraene now that Leos is dead in order to save them from an ill-advised war. Pulled by duty and honor, Ilse makes this long journey back to where her story began, to complete the journey she attempted lives and centuries before and bring peace between the kingdoms. Along the way she learns some hard truths and finally comes to a crossroads of power and magic. She must decide if duty is stronger than a love that she has sought through countless lifetimes. Will Isle give up her heart's desire so that her nation can finally know lasting peace? 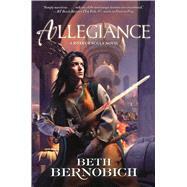 Allegiance is the thrilling conclusion to Beth Bernobich's River of Souls trilogy. Allegiance is the third novel in BETH BERNOBICH's epic River of Souls series. The first, Passion Play, earned her a coveted RT Book Award for Best Epic Fantasy in 2010. Publishers Weekly called the second novel, Queen's Hunt, "A masterful story of romance, honor, suspense, with plenty of history, geography, and mythology thrown in for good measure." Bernobich lives with her husband and son in Connecticut.